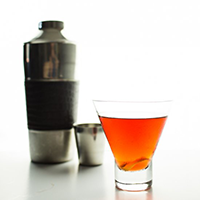 Add ice to a cocktail Shaker and then add the Vodka, Campari and Cherry Brandy. Shake until chilled, about 15 seconds. Strain into Martini Glass and garnish with a Lemon Twist.